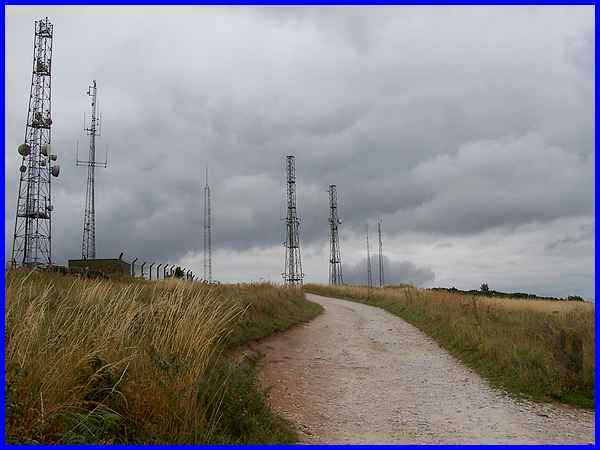 A couple of miles from Wirksworth and not a great deal further from Belper the high ground of Alport Heights is visible from miles around but even more so since the communications masts that now number seven were erected. Nine acres of land near the summit adjacent to but not including the land occupied by the masts, were acquired by the National Trust in 1930 and became the first acquisition by the Trust of a scenic nature in Derbyshire. Access to the Trust land is free of charge and on arrival we opted for the lower of the two car parks but later followed this track (above) to the second area near the masts. Alport Heights is a popular picnic site and also on the hill is a motocross circuit. 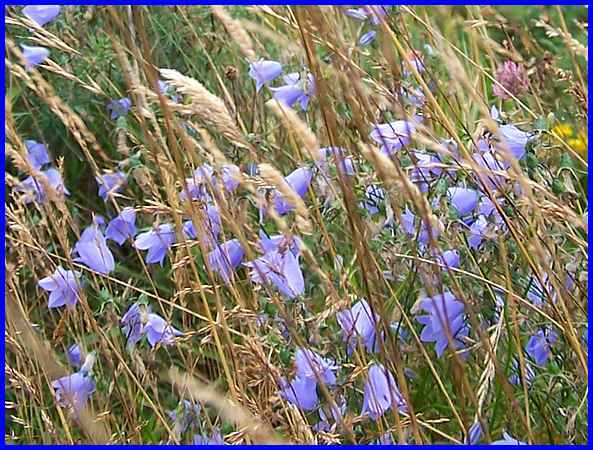 We had approached Alport Heights from the direction of Ambergate along many narrow single track lanes lined with wildflowers and a pretty little bell-shaped variety resembling bluebells and probably part of the campanula family could be seen in abundance all over the area. These were pictured along the track to the car park among the thistles and the grasses. The car park sits above an old quarry and as the hill stands over 1,000 ft (300 m) high there are extensive views especially to the south - one of the attractions of the location. 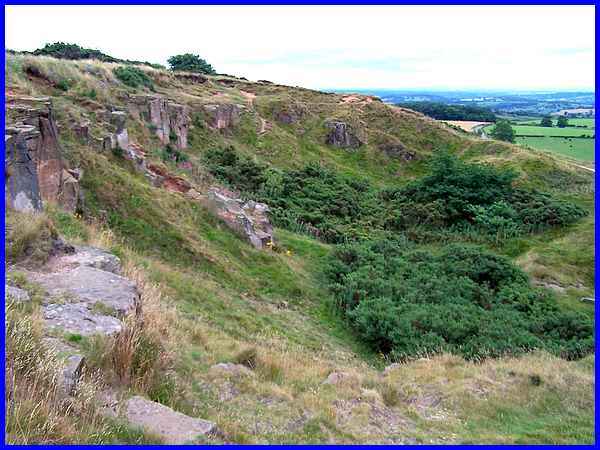 This view over the quarry from just below the car park however is towards the southeast. From the other side of the quarry and a little higher up the landscape of the rolling countryside stretches out to the south and the west. 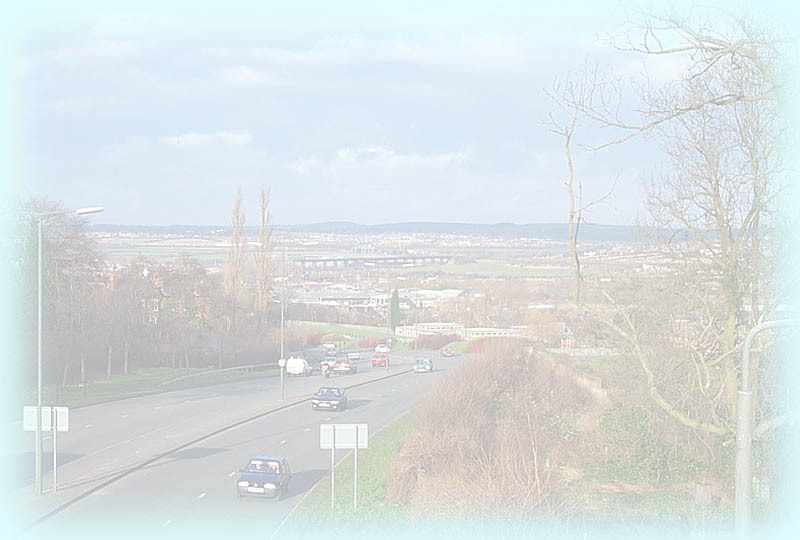 It is said that on a clear day it is not only possible to see Derby from here but also as far away as The Wrekin and the Malvern Hills but from all angles the eye is always drawn to the stone pillar in the foreground. 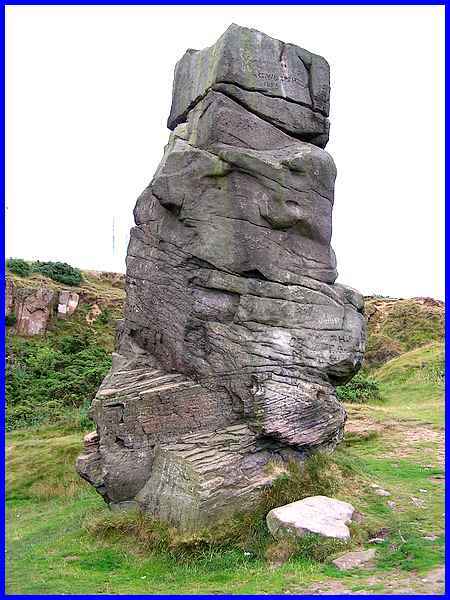 The pillar is the Alport Stone and is not a natural formation but a result of the quarrying activities. It seems that graffiti is not a modern phenomenon as a carving near the top of the stone saying "G Waterfield 1883" can easily be made out. To add some sort of scale to the stone, three men of average height one on top of another would still fall short of its 20 ft top. The stone has gained recognition as a training ground for prospective climbers having three or four recognised routes up it. I'm just content to admire its setting! 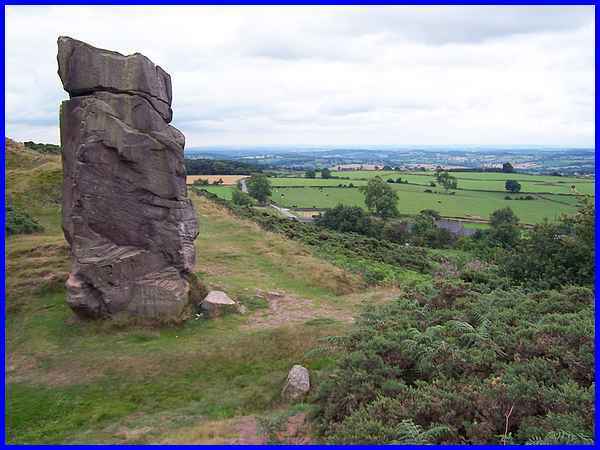 There are three Alports in Derbyshire - a village near Youlgreave, Alport Moor in the High Peak and Alport Heights - and all three are connected by an ancient prehistoric track called the Portway. From the Anglo-Saxon "Port-weg" where "port" meant "market town" the Portway was "the road to the market". Even in those days, the trading route was old and the name Auld-Port (Old market town) gave rise to Alport for significant places on the way. 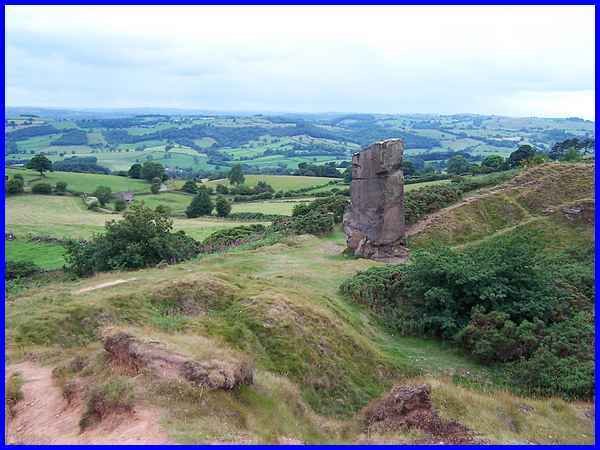 In his book "The Derbyshire Portway, Pilgrimage to the Past - a walking guide" Stephen Bailey traces a forty five mile route from just over the Nottinghamshire border at the Hemlock Stone to Mam Tor near Castleton in the north of Derbyshire. 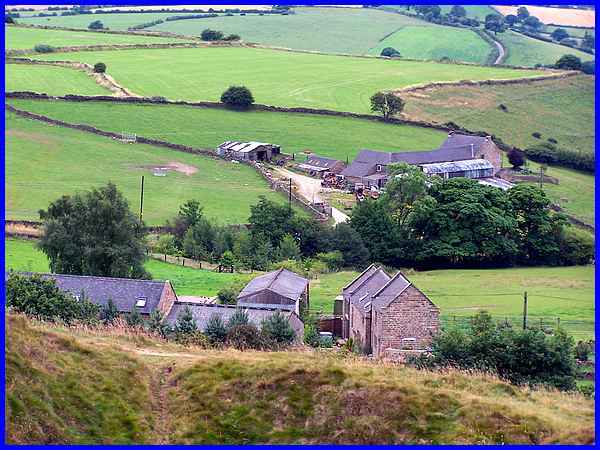 A review of the book says that the route is along quiet lanes through some of Derbyshire's most delightful scenery and that Ashleyhay is a picturesque little hamlet comprised mainly of farms. Zooming down from the heights this image confirms that point of view. Before leaving the Heights we went up to the higher car park near the masts where there were extensive views to the north although perhaps not with the same impact as those over the quarry site. One feature did stand out though to the right of centre in this panoramic view. 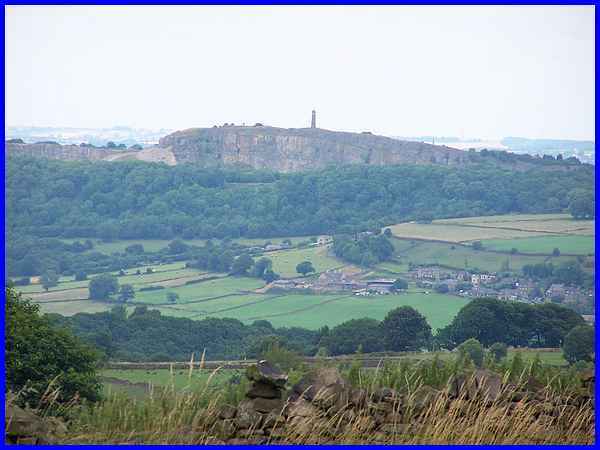 Again applying the zoom on the camera the feature was revealed as the Sherwood Foresters Regimental Memorial at Crich also known as Crich Stand which like Alport Heights stands at over 1000 ft above sea level.